Residence Inn by Marriott Loveland welcomes guests to experience the beauty of Rocky Mountain National Park this spring. Just 40 miles from Loveland, Rocky Mountain National Park is an ideal daytrip for travelers visiting Northern Colorado. The Park offers hiking, biking and much more throughout the year. Trail Ridge Road opens to motorized travel on Friday, May 27th, weather permitting. For more information, please visit https://www.nps.gov/romo/planyourvisit/calendar.htm. Residence Inn by Marriott Loveland is an ideal home-away-from-home for business and leisure guests with comfortable guestrooms, great amenities and a convenient location. All guestrooms include HDTV, fully-equipped kitchen, comfortable bed and much more. Accessible guestrooms are available upon request. Hotel amenities feature: free hot buffet breakfast daily, complimentary Wi-Fi, on-site laundry, outdoor sports court, indoor pool and much more. 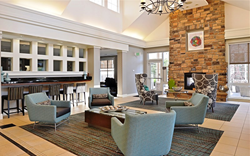 Residence Inn by Marriott Loveland is located near I-25 and a short drive from Rocky Mountain National Park.